896mk3 Hybrid, USB audio interface from MOTU in the 896 series. MOTU is shipping the 896mk3 Hybrid, an enhanced version of their 896 audio interface that now provides connectivity to Mac or Windows computers via Firewire or high-speed USB 2.0. Features include eight XLR/TRS “combo” style analog inputs with preamps, ten XLR analog outputs, a total of 28 inputs and 32 outputs, 192 kHz analog operation, signal overload protection, a 32-bit floating point DSP for digital mixing and effects processing, two banks of configurable optical I/O, and support for time code synchronization. The rear panel of the 896mk3 Hybrid provides both Firewire A (400 Mbps) and hi-speed USB 2.0 (480 Mbps) ports. Users can connect the 896mk3 Hybrid to their computer using either format for operation and low bus latency. The Firewire jacks on the 896mk3 are 9-pin Type B jacks, but they can be connected to any Firewire jack on the computer (6-pin Type A, 4-pin Type A "mini", or Type B) using any standard Firewire cable that has the necessary connectors on it. Other feature updates include computer-controllable pad and 48V phantom power switches for the eight mic inputs. 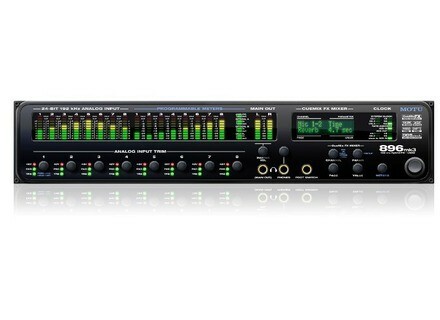 • CueMix FX — 28 input/16 bus mixer with on-board DSP effects, including reverb with sends/returns, plus EQ and compression on every input and output. • 28 inputs / 32 outputs (at 44.1/48 kHz) — there's no channel sharing in the 896mk3; the mic inputs, AES/EBU I/O, S/PDIF I/O, headphone out and main outs are all handled as separate channels. • Front-panel control — access settings in your entire 896mk3 mix from the front panel. • Stand-alone operation — users can program mixes at the studio and then bring the 896mk3 to a gig — no computer needed. If they need to tweak the mix, they can do it on site using the back-lit LCD and front-panel controls. • Multiple CueMix FX mixes — for example, users can create different monitor mixes for the main outs and headphones. Or add send/return loops for outboard gear. • Eight rear panel combo jacks provide 1/4” guitar/line input or XLR mic input with phantom power, pad and gain. • Clip protection — input limiter designed to prevent digital clipping and distortion from overloaded signal levels up to +12 dB over zero. • Eight 24-bit 192 kHz analog inputs and outputs on XLR jacks. • Digital Trim — Digitally controlled analog trim on all analog inputs provides adjustments in 1 dB increments. Users can fine-tune the balance of the analog inputs and then save/recall trim configurations. • Optical I/O — 16 channels of ADAT lightpipe, 8 channels of SMUX (96 kHz) or two pairs of stereo TOSLink. Mix and match formats between the two banks. • Expandable — add additional interfaces for more I/O as connectivity needs grow. • Separate XLR main outs and front-panel headphone jacks, each with independent volume control. • Stereo 24-bit 96 kHz AES/EBU in/out. • Stereo 24-bit 96 kHz S/PDIF in/out. • Word clock in and out. • Foot switch input — located on the front panel; connect a standard foot pedal switch (sold separately) for punch-in and punch-out while recording. Or map the pedal to any keystroke function in your host software. • Includes native 32- and 64-bit drivers for Mac OS X and Windows 7/Vista, including ASIO, WDM, Wave, and Core Audio. Supports most Mac and Windows audio software. • Compatible with host-based effects processing in today's audio programs. • Front panel volume control for monitoring. Stereo, Quad, 5.1, 7.1 and user-defined surround monitoring setups available. • Two front panel headphone jacks with independent volume controls. • Front panel metering for all analog and digital audio I/O. • Dedicated front panel clock status LEDs. • International 100-240V, 50-60 Hz auto-switching power supply. The 896mk3 Hybrid is now shipping at the same price as the original award-winning 896mk3: $995. Avid Fast Track C600 & C400 Interfaces Avid (MA-Audio) introduces its new Fast Track C600 & C400 audio interfaces.